In 1932, Rolf Dobelli came across the diaries of his great-uncle. His uncle had immigrated from a tiny Swiss village to Paris to seek his fortune. In August 1940, two months after Paris was occupied by the German Nazi forces, he noted: “Everyone is certain that the Germans will leave by the end of the year. Their officers also confirmed this to me. England will fall as fast as France did, and then we will finally have our Parisian lives back—albeit as part of Germany.” Instead of two months, the Occupation lasted for four years. The long German Occupation of France is now seen not as an accident but part of a military strategy. This is how history comes across to us always: What has actually happened appears to be the most likely of all scenarios, the most obvious outcome and we go on to justify it with reason. Human minds find it hard to think of alternative paths of history—what else could have happened. We are easy prey to what is called a ‘hindsight bias’. Over the past two decades, behavioural science has opened our eyes to how we actually think and behave. Most often, we act irrationally. Hindsight bias is just one such example. We suffer from endowment effect (cling to things), can’t forget the time and cost spent on a losing enterprise (sunk cost fallacy) and judge decisions by their outcome (and not the process) and come to conclusions by first impressions (primacy and recency effect). 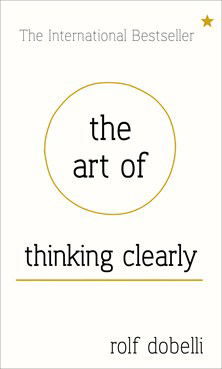 Books describing irrational behaviour and how to deal with it are now common, carrying titles such as Predictably Irrational, Thinking, Fast and Slow, Wilful Blindness, Your Money and Your Brain, The Winner’s Curse, Gut Feelings, Nudge, The Signal and The Noise, etc. Many describe the same famous experiments and, ultimately, hold a mirror to us about the inner workings of our mind, which invariably surprises us. This book topped the German bestseller list and it is now an international bestseller as well. The book is divided into 99 chapters of only three-four pages each, focusing on one kind of behavioural trait or error that characterises us. The subject matter lends itself to real-life stories and experiments, making the book interesting to read. But Dobelli has chosen these with care. You will find scores of appealing anecdotes. Here is one. In 1913, Maximilian Ringelmann, a French engineer, studied the performance of horses. He concluded that the power of two animals pulling a coach did not equal twice the power of a single horse. Surprised by this result, he extended his research to humans. He had several men pull a rope and measured the force applied by each individual. On average, if two people were pulling together, each invested just 93% of his individual strength, when three pulled together, it was 85% and, with eight people, it was just 49%. This is called social-loafing effect. It occurs when individual performance is not directly visible; it blends into the group effort. It occurs among rowers, but not in relay races, because here, individual contribution is evident. Social loafing is rational behaviour: why invest all your energy when half will do—especially when this little shortcut goes unnoticed? Quite simply, social loafing is a form of cheating of which we are all guilty even if it takes place unconsciously just as it did with Ringelmann’s horses. Here is one more that describes the importance of knowing what you really know and have no opinion about the rest. After receiving the Nobel Prize for physics in 1918, Max Planck went on a tour across Germany. Everywhere he delivered the same lecture on new quantum mechanics. Over time, his chauffeur grew to know it by heart. He said: ‘It has to be boring giving the same speech each time, Professor Planck. How about I do it for you in Munich? You can sit in the front row and wear my chauffeur’s cap.’ Planck liked the idea, so that evening, the driver held a long lecture on quantum mechanics before a distinguished audience. Later, a physics professor stood up with a question. The driver recoiled: ‘Never would I have thought that someone from such an advanced city as Munich would ask such a simple question! My chauffeur will answer it’ he said, passing the mike to Planck. This apocryphal story has a genuine message: According to Charlie Munger, Warren Buffett’s partner in Berkshire Hathaway, there are two types of knowledge. Rolf Dobelli, a PhD in philosophy, the co-founder of Getabstract.com, has not written anything new. Original work on this subject has been done by Daniel Kahnemann (Nobel Prize winner), Amos Taversky, Gerd Gigerenzer and Richard Thaler. Dobelli has put it all together making it highly accessible with bite-sized chapters. And, yet, this book has become a bestseller. 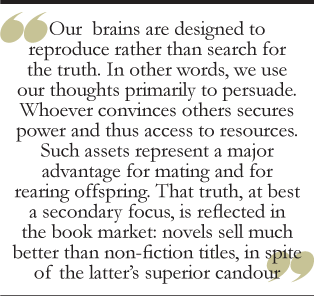 In that sense, its success is based on the same human irrationality it describes! Having said that, if there is just one book you should buy on this topic, this is the one, available at a special Indian price. Thank you Mr. Basu. Simply too good! What do trading and fly fishing have in common? 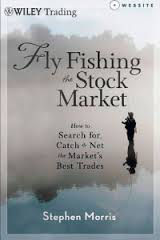 Both require passion, patience and persistence; at least according to fisherman-turned-trader Stephen Morris who has penned Fly Fishing the Stock Market (Wiley; $75; 280 pages). He calls these traits the three Ps. 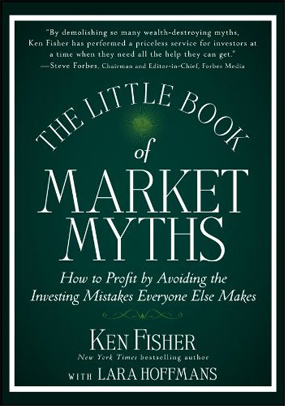 However, there’s an important point to note: this book is purely about technical analysis and not about ‘bait fishing’ (i.e., long-term investing; fishermen who just cast their fishing net and simply wait). It is purely for short-term traders or ‘fly fishers’. Drawing upon his experiences as a fisherman, Morris explains how to approach trading the way he approaches fly-fishing. He explains that, in order to catch a good fish (or a good trade) one needs to know his ecosystem (or markets) and be extremely observant, even for tiny signals in the lake, so to speak. The chapters are very interestingly titled, with fishing terminology, and sequenced in linear fashion, right from the assembling of the ‘fishing toolbox’ (i.e., tools that the trader should possess) to the final catch (close a trade). The book has several analogies with fishing that are cited to illustrate a point. 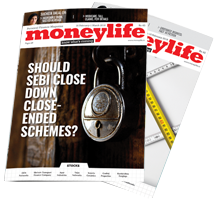 For instance, in one chapter titled “Fishing Seasons/Market Seasons”, he talks about how fishing strategy varies in different times of the year and the same applies to stock markets as well. He also talks about the importance of keeping a trading journal, just as a fisherman keeps a fishing journal. This helps traders improvise upon successes and mistakes alike. Printed on art paper, in colour and full of illustrations (both of which explain the book’s high sticker price and weight), it is definitely not for beginners. Once you open it, you will be blown away by the fancily illustrated charts that could scare off even the most seasoned trader. Even though the publisher claims the book to be ‘accessible’, it isn’t. 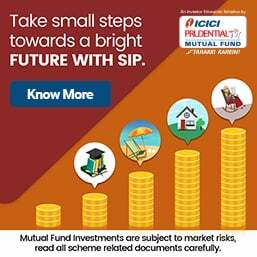 I feel it is more targeted at traders who’ve had a fair amount of knowledge of the markets and who seek more insights into the trading process, based mainly on technical analysis.